Billings, Montana, bills itself as Montana’s Trailhead and standing on the edge of the City’s famed rimrocks give a perfect indication why. Seven mountain ranges dot the view, Pryor, Big Horn, Bull, Snowy, Crazy, Absaroka, and Beartooth, and a wealth of other outdoor activities is plainly evident. 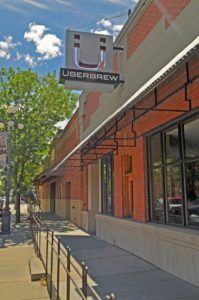 Billings is also home to Überbrew, the 2016 Small Brewery of the Year, as awarded by the national Brewers Association at the Great American Beer Festival, and six other breweries that are quickly turning the city into a beer destination. Add two distilleries and a cider house and the availability of craft beverages is impressive. 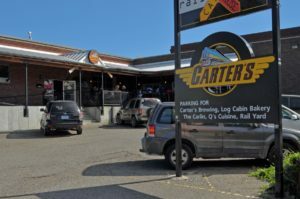 Patrons enjoying Carter’s Brewery in Billings, Montana. Jill Dawson, co-owner of Thirsty Street Brewing Co. with husband Shea, echoes this sentiment. Thirsty Street is Billings’ newest brewery, but has found nothing but cooperation from their peers. Historic Montana Avenue serves as the central corridor for the city’s unofficial walkable brewery district. The 1.5 mile route will take you by the six downtown breweries, two distilleries and the cider house. Montana Avenue is soon to be home to a hop fence, a five block stretch where the hop-lined fence will form the backdrop to interpretive signs describing the history of Billings, while figuratively connecting the breweries. 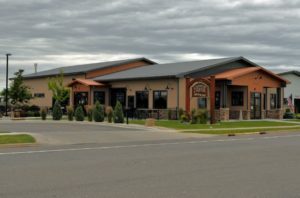 Yellowstone Valley Brewing Co. sits at the northeastern end of the route and features one of the city’s most popular places for live music. The brewery also makes the mash for its sister company and neighbor, Spirit of Montana Distilling. From there it’s a short walk to the Last Chance Pub and Cider Mill, created by Sam Hoffman, the owner of Red Lodge Ales in nearby Red Lodge, Montana. 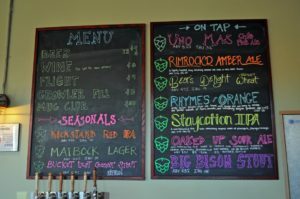 In addition to local cider, the Pub serves all of Red Lodge Ales’ beers. Within eyeshot just down Montana Ave. is Carters’ Brewing where owner Michael Uhrich is known as one of the hardest working brewers anywhere. Despite being a one man show on the brewing side, Uhrich manages to keep an average of sixteen beers on tap, many of which have introduced Billings’ beer lovers to styles rarely seen at any brewery. Part of Carter’s Brewery’s taproom and production space. 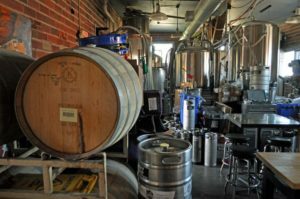 Even the space screams hard work, with barrels and kegs stashed in all corners of the cramped tap room and brewery space. Railroad spikes form the handles of the sample trays, honoring the active rail lines located a few feet past the narrow outdoor deck. From an hibiscus sour to an hommelbier and plenty of saisons to IPAs, making choices is the only difficult part of a trip to Carters’. This selection is why local homebrewer and all-around beer fan Damien Leonard likes to start his brewery district adventures at Carters’. “Mike is a powerhouse of beer selection and flavors,” says Leonard. “He has one of the best menus in town and is always pushing the limits. His one man show never gets old and is always changing.” New for 2018 at Carter’s is a long-awaited expanded tap room. Continuing along Montana Avenue to the next stop will take a little longer, but brings you past the Western Heritage Center, part of Billings’ growing art and culture scene. After taking in the stories of the peoples of the Yellowstone River Valley and Northern Plains at the Center, the tour takes you to Angry Hank’s Microbrewery. Named after a grumpy family friend, it’s the second location for this popular brewery, having started out in 2005 in a renovated service station less than a half mile away. 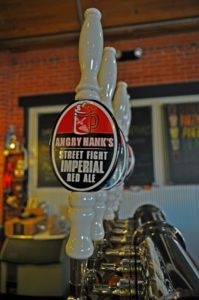 Angry Hank’s Street Fight Imperial Red ale boasts the most craft tap handles of any beer around the City. At the tap room, you’ll find flagships on tap, including the Street Fight, Anger Management Belgian Wheat, Head Trauma IPA and Dog Slobber Brown, along with several rotating seasonals. 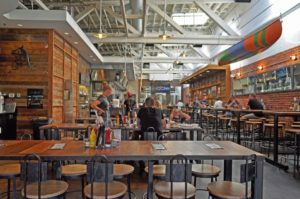 The brick, steel and wood of the converted garage creates a comfortable interior while the outdoor patio is a great place to kick back and rest up for the last two stops on the tour. Fortunately, you can practically roll to the next one, at least for a little while longer. 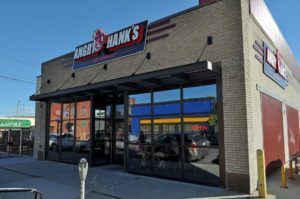 Thirsty Street Brewing Co. shares a back wall with Angry Hanks. 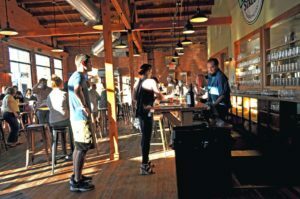 Like all Billings’ breweries, Thirsty Street is a lively place where finding a table or bar stool can be a challenge at times. The warm, inviting space often hosts live music on the weekends and has a game room with shuffle board, billiards, and darts for any day of the week. Thirsty Street is increasingly experimenting with sour beers, most recently offering two versions of a sour golden ale aged in French oak chardonnay barrels, one dry hopped with Amarillo hops and the other dry hopped with Jarrylo hops. The Dawsons opened Thirsty Street in the space that previously held Himmelberger Brewing Co. Dennis Himmelberger was the first to open a modern era brewery in Billings, doing so in 1994 when Montana had only a handful of breweries. 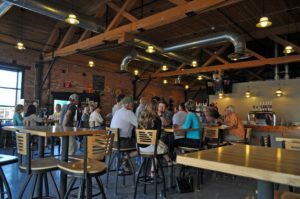 Inside Thirsty Street Brewing Co.
Himmelberger was also a state representative in the Montana Legislature and was instrumental in helping change the state’s brewery laws in 1999 to give breweries the right to sell beer for on-premise consumption. Come 2019, Thirsty Street expects to move its brewery and taproom to a new location on Billings’ West End. The downtown space will be converted into a restaurant. The final stop of the walkable brewery district is Montana Brewing Co. which bills itself as Montana’s most award winning brewery. Its list of medals from prestigious competitions like the Great American Beer Fest and World Beer Cup make that boast hard to argue with. 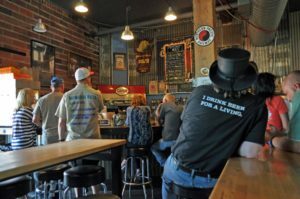 The always packed pub space is a favored food stop in Billings and rotating seasonal beers compliment the brewery’s flagships like Custer’s Last Stout. 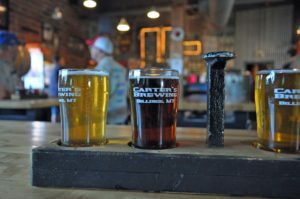 It’s Friday night and the place is packed, a regular sight at Canyon Creek Brewing Company, the only Billings brewery not located in the city’s downtown – that is until Thirsty Street makes its upcoming move. Other brewers cautioned owner/brewer Ron Kalvig about choosing Billings’ west end to locate his brewery, but the crowds have deemed such words foolish. A storm has chased the crowed off the sizeable outdoor patio, past the fire pits, and through the garage doors to the large taproom inside. Ron and his partner, Dianna Walker, hold court at the end of a long day, visiting with patrons as they do most days. It seems everyone is friends here, and it’s clear that’s no accident. Ron started homebrewing in 1999 and was “the homebrewer everyone knew would someday go pro,” said one Billings’ brewer who has been in the business a long time. Ron is also a whiz at welding and just about everything else mechanical the brewery needs. Canyon Creek’s Scottish ale is a crowd favorite, but beers range from a malt liquor and lemonade shandy to a gose and a variety of IPAs.